As the conversation continues, I often find the prospective computer buyer knows as much as I do, spouting off the latest developments in processors, DVDs, hard drives, video cards, RAM and more. I find that the world has filled us with a kind of never-ending technology lust. We'll spend another $100 for 33 MHz more or $25 for another 5G or $40 for 12X instead of 4X. Why buy a 1-GHz Pentium III when Intel plans to release a 1.4-GHz Pentium 4 processor later this year? Sometimes it's even worse. The buyer, hoping to squeeze out another year of use, will spend an extra $300 for the premium processor running at 1.13 GHz. I'm going to lift the rock and expose a dirty secret: Folks, you can't take advantage of that extra speed. Sorry, it's all a ruse of numbers, overmarketing you with facts, trying to make you believe you're getting more than you actually are. Processors at about 600 MHz provide all the processing power you need for all except the most intense, scientific computing. By the way, nothing from Microsoft Corp., other than Visual Basic compiling, counts as 'intense, scientific computing.' Neither do Quake III or Diablo II, for those closeted gamers out there. I might be ostracized for saying it, but no one needs a 1-GHz processor. That speed gives bragging rights to processor makers ('I made it to 1 GHz faster than you did ' nanny-nanny-boo-boo!') but won't change your computing experience. Ladies and gentlemen, just examine the ever-so-slight differences here. I daresay that if I hid the beige boxes from your sight, you couldn't tell the performance difference between the 550-MHz and 1-GHz desktop systems in your everyday computing. Today's mainstream applications cannot take advantage of the computing power inside today's PCs. Moreover, short of downloading every MP3 song from the 1980s, I challenge you to fill up a 75G hard drive'the current top-of-the-line storage offering. Unless you're playing three levels of Quake III on three monitors, you do not need 64M of memory on a video card. Short of opening more than 20 applications at a single time, you can't take advantage of more than 256M of RAM, especially if you're running Windows 9x, which needs only 128M. And even if that DVD spins 4X times faster, you're not going to watch the movie faster. It's noble to future-proof, but it doesn't matter because the next great thing is on the horizon and everything will be out of date within six months. Think about it: Will a 1-GHz Pentium III give you longer life when Intel is releasing a 1.4-GHz Pentium 4 later this year? Two years from now, you'll want the Pentium 5 with Windows 2002. The latest and greatest. The fastest and biggest. They accomplish little except for gouging extra cash from your'and the government's'pocketbook. 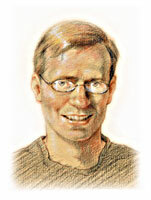 Michael Cheek is senior editor and GCN Lab director. E-mail him at mcheek@gcn.com.